Last week, I was most impressed by Bigg Boss. A male contestant, Ali, stroked the thigh of a female contestant, Sonali, without her consent - and was taken to task for doing so. It was good to see the serial, not known for its high standards of behaviour, to stand up for a woman’s right of choice and consent. But good things rarely last, especially on Bigg Boss. The very next day, the Bigg Boss creative team came up with a stunt that was ludicrous and offensive on so many levels that I’ve lost count. Parineeti Chopra, who had entered the house to promote her new film Kill/Dil accused the same contestant – Ali -- of touching her inappropriately. Salman Khan, Govinda, Parineeti Chopra, Ali Zafar and Ranveer Singh then read Ali the riot act, berating him as a repeat offender who needed help…. until it was revealed to be a prank a few minutes later. Because you see sexual harassment is so funny. The notion that treating it as a joke is insulting to the girl who had been inappropriately touched less than 48 hours ago seems to have eluded the dim-witted wonders on the stage and behind it. Was there a hue and cry over the tasteless stunt? No. Because what’s a little sexual harassment humour between friends? But two days later -- almost as a face-saver to show that Bigg Boss does indeed care -- the team expressed great concern over the supposed assault of a man by another man. Not sexual assault, but simply physical assault (you have to qualify these finer points while writing on the subject of Bigg Boss). The incident involved Puneet Issar -- he of Duryodhana fame and otherwise known for almost knocking off Amitabh Bachchan on the sets of Coolie -- is this season’s elderly contestant. 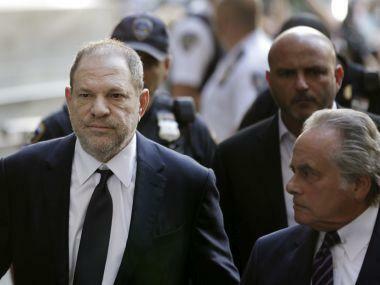 He oscillates between being wise, abusive, and weepy, all interspersed with shots of him flexing his muscles while wearing shorts which are so tiny that they ought to count as sexual harassment of female viewers. He is also lovingly called Punz by Sallu. Punz, while in the midst of one of the many infantile tasks played by the Bigg Boss contestants, tackled Arya Babbar – the less famous son of Raj Babbar. It was something akin to a wrestling tackle, although Punz says calls it a "martial art" move. Irrespective, Puneet Issar is a very big, very strong man, and he pretty much made Arya levitate right off the ground. Babbar didn’t demand that Issar be eliminated, but did claim that his neck had been twisted. But suddenly the disembodied Bigg Boss voice announced that Issar was eliminated from the house for displaying hinsa or violence – which is a big no-no in the house (unlike sexual harassment, which is a laughing matter). This is in keeping with earlier seasons where people ranging in fame from KRK (my all-time favourite who is like a slightly seamy Yoda on Twitter) to Kushal Tandon have been thrown out because of violence. Of course, this great show of propriety has been short-lived. 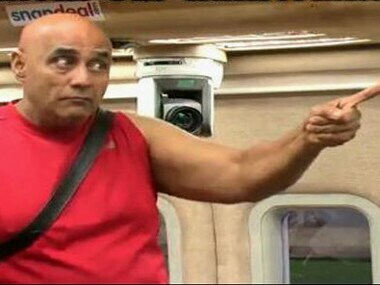 Today, Puneet Issar issued a video statement and apology to the other contestants. Sitting in a pitch-black room -- looking like he’d been kidnapped by ISIS and was going to be summarily halal-ed right after -- Issar said he was devastated by how he’d behaved. Boo hoo. Thanks to this show of false penitence, Issar will be back in the house in a jail cell constructed on the lawns, abusing the others from behind the bars of his faux prison (or so the preview of the next episode tells me). What’s more disturbing than any of this rubbish, is that "Duryodhan of Maharbharat" (the incorrect spelling is of Facebook’s and not mine) has been trending for the last 24 hours on facebook. Really? This is what the denizens who log onto Facebook are talking about? Not that the Bigg Boss team mocked sexual harassment? But there I go again, expecting some semblance of propriety and balance in what appeals to the audiences of reality TV. A has-been actor who resembles a larger version of Manohar Aich physically tackling a non-actor and causing no tangible physical harm is worth discussing, but not a prank which showed that getting sexually assaulted or molested in Bigg Boss house is a big joke? The worst part is that even the girl whose thigh was felt up by Ali hasn’t shown any umbrage at the distasteful prank. So why should the Bigg Boss team show any remorse? Parineeti Chopra has washed her hands off the prank by claiming that she blindly followed the instructions of the Bigg Boss creative team (God forbid, she should exercise any independent judgement). The fitting punishment for her justification and her willingness to participate in such a prank, should be that people boycott her next film. In the meantime though, let’s watch Issar allow himself to be locked up in a mock jail cell on national television – just so he can spend a few more weeks on the show. In the meantime, I will keep myself busy wondering what it says about me that I tune in to watch the show every day. Maybe because it is like watching a car wreck, an experience filled with equal part horror and fascination, driven by that eternal question: Just how bad can this get?